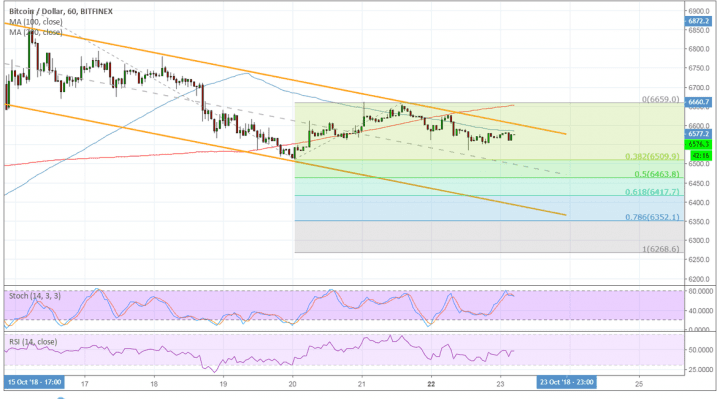 Bitcoin has formed lower highs and lower lows to create a descending trend channel visible on its 1-hour chart. Price just came off a test of resistance and might be due for a move back to the bottom or the downside targets marked by the Fibonacci extension tool. The 100 SMA is below the longer-term 200 SMA to confirm that the path of least resistance is to the downside or that the selloff is more likely to resume than to reverse. In addition, the 100 SMA appears to be holding as dynamic resistance near the top of the channel as well. A break past this area could spur a test of the 200 SMA dynamic inflection point near the swing high. With that, bitcoin could fall to the 38.2% Fib next around the $6,500 mark. The 50% level is closer to the mid-channel area of interest and might also draw support. Stronger selling pressure could take price to the 61.8% to 78.6% levels near the channel support or all the way down to the full extension at $6,268. Stochastic is starting to turn lower to signal a return in bearish pressure without even hitting overbought levels. This signals that bears are eager to return and push price back down. Meanwhile, RSI is moving sideways to signal further consolidation. Bitcoin traders are likely holding out for another set of positive catalysts to sustain the recent moves and the lack of these is prompting more profit-taking from earlier gains. Still, the longer-term outlook is mostly positive as the launch of Fidelity’s institutional platform would likely mean more investments flowing in. In turn, higher trading volumes and increased activity could boost prices, possibly enough to spur a rebound from the drop late last year. However, there is some degree of wariness leading up to the launch of ICE Bakkt bitcoin futures as last year’s CME bitcoin futures launch was blamed for the declines.